The number of countries running high-speed rail is expected to double over the next few years, according to new research by the Worldwatch Institute. By 2014, high-speed trains will be operating in nearly 24 countries, including China, France, Italy, Japan, Spain, and the United States, up from only 14 countries today. The increase in HSR is due largely to its reliability and ability to cover vast geographic distances in a short time, to investments aimed at connecting once-isolated regions, and to the diminishing appeal of air travel, which is becoming more cumbersome because of security concerns. A 2006 comparison of greenhouse gas emissions by travel mode, released by the Center for Neighborhood Technologies, found that HSR lines in Europe and Japan released 30-70 grams of carbon dioxide per passenger-kilometer, versus 150 grams for automobiles and 170 grams for airplanes. Although there is no universal speed definition for HSR, the threshold is typically set at 250 kilometers per hour on new tracks and 200 kilometers per hour on existing, upgraded tracks. The length of HSR tracks worldwide is undergoing explosive growth in order to meet increasing demand. Between 2009 and 2011, the total length of operational track has grown from some 10,700 kilometers to nearly 17,000 kilometers. Another 8,000 kilometers is currently under construction, and some 17,700 kilometers more is planned, for a combined total of close to 43,000 kilometers. By track length, the current high-speed leaders are China, Japan, Spain, France, and Germany. Other countries are joining the high-speed league as well. Turkey has ambitious plans to reach 2,424 kilometers and surpass the length of Germany’s network. Italy, Portugal, and the United States all hope to reach track lengths of more than 1,000 kilometers. Another 15 countries have plans for shorter networks. But in Europe, France continues to account for about half of all European high-speed rail travel. HSR reached an astounding 62 percent of the country’s passenger rail travel volume in 2008, up from just 23 percent in 1990, thanks to affordable ticket prices, an impressive network, and reliability. And in Japan, the Shinkansen trains are known for their exceedingly high degree of reliability. JR Central, the largest of the Japanese rail operating companies, reports that the average delay per high-speed train throughout a year is just half a minute. On all routes in Japan where both air and high-speed rail connections are available, rail has captured a 75 percent market share. A draft plan for French transportation infrastructure investments for the next two decades allocates 52 percent of a total of $236 billion to HSR. In 2005, the Spanish government announced an ambitious plan for some 10,000 kilometers of high-speed track by 2020, which would allow 90 percent of Spaniards to live within 50 kilometers of an HSR station. Currently, China is investing about $100 billion annually in railway construction. The share of the country’s railway infrastructure investment allocated to HSR has risen from less than 10 percent in 2005 to a stunning 60 percent in 2010. Intercity rail in Japan accounts for 18 percent of total domestic passenger-kilometers by all travel modes—-compared with just 5 to 8 percent in major European countries and less than 1 percent in the United States. In France, rail’s market share of the Paris-Marseille route rose from 22 percent in 2001 (before the introduction of high-speed service) to 69 percent in 2006. 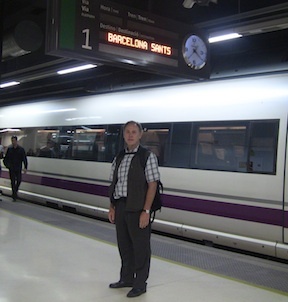 In Spain, the Madrid-Seville rail route’s share rose from 33 to 84 percent. High speed rail in the United States by 2014? Acela? Are you kidding?? Good point. Acela should be considered medium-speed rail at best, not HSR. Seeing the upsurge in using solar power for the energy source is exciting! Once the front end costs are paid, the trains will run for the most part, on the free energy from the sun. Fares should be much less expensive.